Assessing and caring for pediatric patients can be a challenge for EMS providers. Small children cannot verbalize what is bothering them, and the assessment depends heavily on a physical exam and vital signs. Normal vital sign ranges change with age, and can be difficult to obtain when children are crying, agitated or uncooperative. Pediatric patients may look well while compensating for a serious illness or injury, and suddenly deteriorate. Waveform capnography can help identify sick children from healthy children, helping EMS providers accurately intervene before decompensation occurs. Waveform capnography is a noninvasive tool that can be applied to children of all ages to assess ventilation, perfusion and metabolism. Capnography measures the amount of CO2 present at the end of exhalation (end-tidal CO2, or ETCO2), displays a waveform that represents air movement through the respiratory cycle, and continuously monitors respiratory rate. Normal ETCO2 is 35-45 mm HG, and a normal waveform is rectangular shaped. These values are consistent across all age groups. ETCO2 is measured with either an adaptor connected to a BVM or advanced airway device, or through a nasal cannula with a sampling line. Pediatric and neonatal-sized capnography circuits should be used when indicated to ensure accuracy. Seizures, head injuries, and overdoses are common causes of altered mental status in pediatric patients that can cause airway compromise or hypoventilation. Since it is also common for sick children to fall asleep during the ambulance ride to the hospital and have no respiratory depression waveform capnography can help determine when an airway or ventilation intervention is needed. The capnography waveform and respiratory rate allow for breath-to-breath monitoring, and immediate detection of hypoventilation or apnea. Depending on tidal volume with hypoventilation, ETCO2 may either rise or fall. A slow respiratory rate with a normal tidal volume will cause ETCO2 to increase, as CO2 builds in the lungs and gets excreted with each breath. A decrease in tidal volume will cause ETCO2 to decrease, as most of the exhaled air captured is from dead space while CO2 continues to accumulate in the lungs. Capnography is more reliable than pulse-oximetry to detect hypoventilation, which may take several minutes to change after a patient stops breathing . Once hypoventilation is detected, capnography provides continuous feedback on how a patient responds to interventions. When hypoventilation is caused by an airway position issue, capnography waveforms will return after repositioning the patient’s head, placing a towel under the shoulders of younger children, or suction. Occasional tactile stimulation may be all that is necessary to correct some forms of respiratory depression. Capnography can guide when tactile stimulation is effective, and if assisted ventilation is needed. Effective ventilation with a bag-valve mask requires the upper airway to be in the correct position or alignment and for the mask to be sealed tightly on the face. Just enough air should be delivered to make the chest rise. It is also important to ventilate at the appropriate rate. When capnography is utilized with a BVM, a waveform with each ventilation indicates that there is a good mask seal, a patent upper airway and that air is exchanged in the lungs . Healthcare providers often ventilate children too fast, which decreases cardiac output and puts children at risk of lung injury. Waveform capnography can also be used to guide the ventilation rate, which is 12-20 breaths per minute in children . In children who require an advanced airway to be placed, waveform capnography is the most reliable method to confirm placement . Unacceptably high rates of misplaced endotracheal tubes have been documented in children. It is a skill that few EMS providers get experience performing and there is a high risk of tube dislodgement during movement and transport. A capnography waveform will appear with the first breath if the tube is placed in the trachea and immediately disappear if the tube is displaced. Waveform capnography can also be used to monitor placement of pediatric-size supraglottic airway devices. ETCO2 and respiratory rates through the duration of care can be archived, which provides documented proof of correct airway placement. Difficulty breathing is one of the most common EMS calls for children. A key treatment decision is whether respiratory distress is caused by bronchospasm and if a nebulized bronchodilator (such as albuterol) is indicated. Bronchospasm is most often caused by asthma and reactive airway disease, and sometimes bronchiolitis, bronchitis or pneumonia. Bronchospasm presents with wheezing or diminished breath sounds, which can be a challenge to hear when auscultating lungs sounds. Children have faster respiratory rates, small chest diameter, and less tidal volume at baseline than adults. Children may also cough or cry during assessment, and sounds associated with upper airway inflammation may be transmitted into the chest. The shape of the capnography waveform can be used to diagnose bronchospasm. When lower airways are constricted, the normally rectangular shaped waveform will have a sloped, “shark-fin” appearance , and albuterol is indicated. If the waveform is rectangular shaped, respiratory distress is from another cause and albuterol will not help. Children may appear less anxious, show less respiratory effort, and have a slower respiratory rate with both improvement in ventilation or deterioration into respiratory failure. Waveform capnography can help differentiate improvement from deterioration. The capnography waveform will change back to a rectangular shape when patients respond well to a breathing treatment. The angle of the waveform will become steeper if bronchospasm worsens, which suggests that assisted ventilation is needed. In addition to air movement in the lungs, ETCO2 also depends on CO2 production as a byproduct of metabolism, and for that CO2 to be circulated to the lungs for elimination. All of these are compromised in cardiac arrest, and capnography provides objective, real-time feedback on CPR quality. Higher ETCO2 correlates with an increase in cardiac output from CPR, with a goal of maintaining ETCO2 above 10-15 mmHG . When ETCO2 is lower, focus on improving chest compression depth and recoil, maintaining a rate of 100 compressions per minute, and a ventilation rate of 8-10 breaths per minute . A decline in ETCO2 suggests fatigue and is a prompt to change compressors. In cases of prolonged down time or severe shock, even perfect compressions and ventilation may not generate any cellular metabolism, and no ETCO2 would be detected. 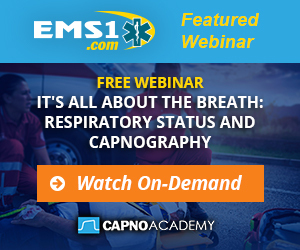 This is one circumstance when capnography will not reliably confirm advanced airway placement . Monitoring capnography during CPR reduces the need to pause compressions to check pulses. When resuscitation is successful and circulation returns, a sudden, sustained rise in ETCO2 will occur before a pulse can be detected . This can be continuously monitored with capnography; as long as a waveform appears with each ventilation, the patient is perfusing on their own. A decline in ETCO2 in a post-arrest patient may be a sign of falling cardiac output and a sign of impending rearrest. Children’s physiology allows them to compensate for shock by increasing pulse and respiratory rate, and maintain a normal blood pressure for a long period of time. They may then decompensate and lose their blood pressure quickly, which is often irreversible. Common causes of shock in children include trauma, sepsis and dehydration. Other benign conditions also cause an elevated respiratory rate, such as fever and anxiety, which can mimic shock. Adding capnography to physical exam findings and vital signs can help detect shock before decompensation. Decreased perfusion to the cells causes metabolic acidosis, and the respiratory rate increases to blow off excessive CO2 to compensate. This presents as a rapid respiratory rate with no signs of increased work of breathing, known as effortless tachypnea. One study of children with dehydration from vomiting and diarrhea found that an ETCO2 level less than 31 mm HG correlated with positive blood tests for metabolic acidosis, and the need for IV fluid resuscitation. Shock also causes a reduction in pulmonary blood flow, which would present with lower ETCO2. In addition to treatment decisions, this can be used to direct children to the most appropriate hospital and for triage when they arrive. Waveform capnography is a valuable tool to assess pediatric patients and make accurate treatment decisions. It can be used to monitor any condition that involves airway management, ventilation, circulation and metabolism. Bob Sullivan, MS, NRP, is a paramedic instructor at Delaware Technical Community College. He has been in EMS since 1999, and has worked as a paramedic in private, fire-based, volunteer, and municipal EMS services. Contact Bob at his blog, The EMS Patient Perspective. Becker H, Langhan M. Capnography in the pediatric emergency department: clinical applications. Pediatric Emergency Medicine Practice 2013;10(6):1-24. Wales, R.A., Dycott, W. Analysis of the efficacy of waveform capnography monitoring using bag-valve-mask ventilation. Kleinman ME, Chameides L, Schexnayder SM, Samson RA, Hazinski MF, Atkins DL, Berg MD, de Caen AR, Fink EL, Freid EB, Hickey RW, Marino BS, Nadkarni VM, Proctor LT, Qureshi FA, Sartorelli K, Topjian A, van der Jagt EW, Zaritsky AL. Part 14: pediatric advanced life support: 2010 American Heart Association Guidelines for Cardiopulmonary Resuscitation and Emergency Cardiovascular Care. Circulation. 2010;122(suppl 3):S876–S908. Nagler J., Krauss B. Capnography: a valuable tool for airway management. Emergency Medicine Clinics of North America. 2008;26(4):881-897.